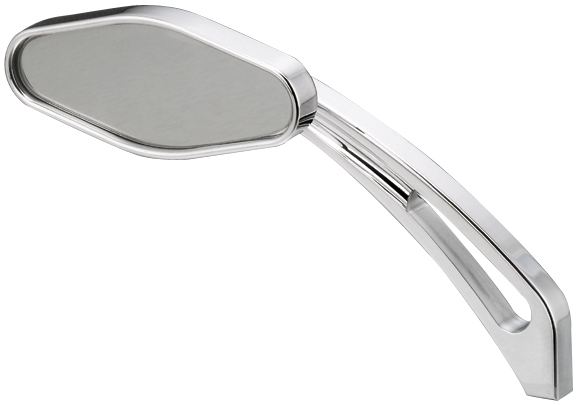 Oval Custom Motorcycle Mirrors with Nail Stem are direct bolt on replacements for the stock Harley Davidson mirrors or can be installed on any custom chopper, bobber and most custom bikes. 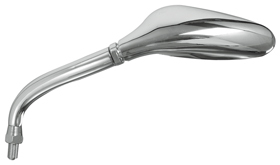 They work as left or right side motorcycle mirrors, since mirror head can be unbolted and assembled on the either side of the stem. These custom motorcycle mirrors are machined out of top quality aluminum and beautifully finished. These billetaccessories feature a very distinctive design and perfectly match our Custom Hand Controls and Race Motorcycle Hand Controls. We also offer black custom motorcycle mirrors for customers that prefer the “dark look”. 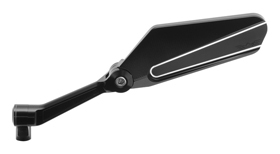 They can be used as metric motorcycle mirrors when installed with our Mirror Adapter for Metric Cruisers. Sold individually.